Vitamin B12 (cobalamin) is one of the most complex vitamins in existence. Cyanocobalamin, the most common form of supplemental B12, must be converted first into hydroxocobalamin, and then into adenosylcobalamin, the body's B12 storage form and one of two active coenzyme forms. Adenosylcobalamin may also be converted into methylcobalamin, the other active coenzyme form. Taking hydroxocobalamin allows the body to skip a step in this conversion process, and the lozenge form allows for faster absorption. Primary Uses: Hydroxocobalamin helps the body to rid itself of cyanide, both by reacting with the toxin to form cyanocobalamin (which can then be excreted) and by enhancing the detoxification of cyanide through its conversion into the less toxic thiocyanate. Hydroxocobalamin has a long history of intravenous use for acute, life-threatening cyanide toxicity (such as during industrial disasters) and is approved for this use in many European countries. Secondary Uses: Scientists have identified B12 deficiencies as risk factors for a multitude of conditions, including neuropathy, myelopathy, anemia, cardiovascular problems and mood imbalances, among others. Hydroxocobalamin is a better choice than cyanocobalamin for those concerned with chronic, low-level cyanide exposure since cyanocobalamin actually contains cyanide. 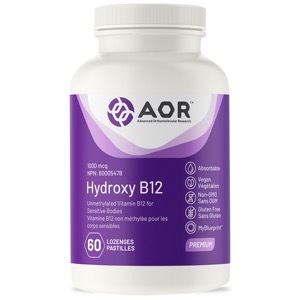 Hydroxy B12 helps rid the body of cyanide while delivering the essential functions of standard vitamin B12. B12 supplements in general are especially important for vegetarians and to help prevent pernicious anemia. Fortin JL, Desmettre T, Manzon C, Judic-Peureux V, Peugeot-Mortier C, Giocanti JP, Hachelaf M, Grangeon M, Hostalek U, Crouzet J, Capellier G.